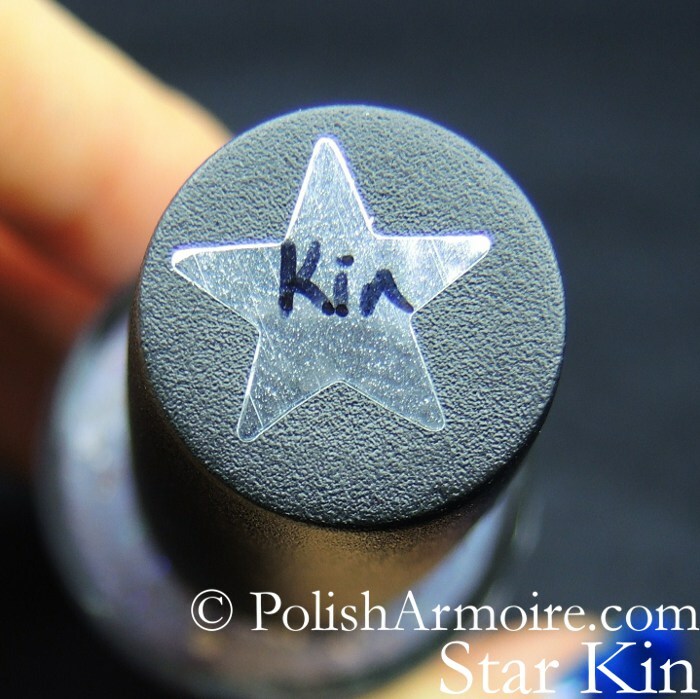 Today’s post features nail polish created by the talented New Zealand indie polish maker Star Kin! I’m starting off with the two polishes I had custom made for me which are State of Grayce and 50 Shades of Grayce (“Grayce” is a play on my name and the word “gray”). State of Grayce is a pink crelly with various sized white, grey and opalescent glitter and I used two coats on my ring finger below. 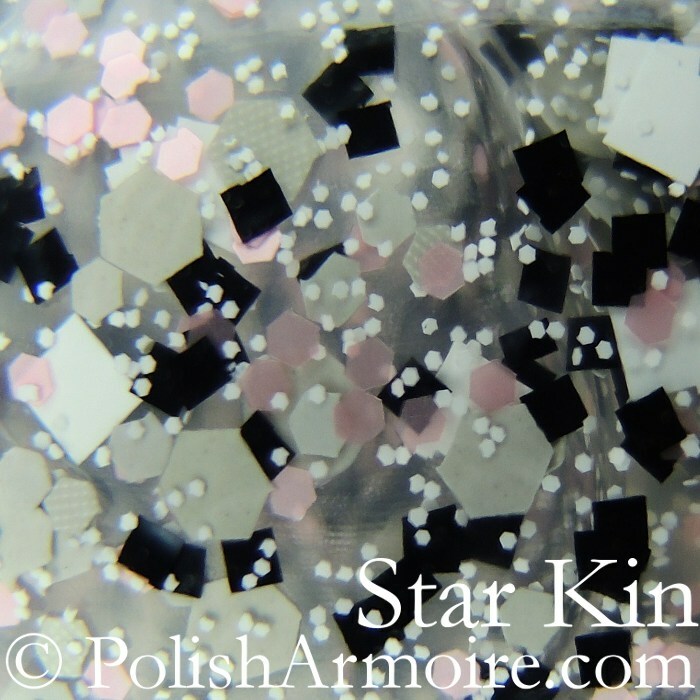 50 Shades of Grayce contains the same glitter with the addition of pink hex glitter in a clear base. The phrase “50 Shades of Grayce” represents the fact that the glitter topper can be put over 50 different base colours. I used one coat of 50 Shades of Grayce over two coats of Orly Jealous, Much? (a green jelly polish) and two coats of NYX Pistachio (a light blue jelly polish). 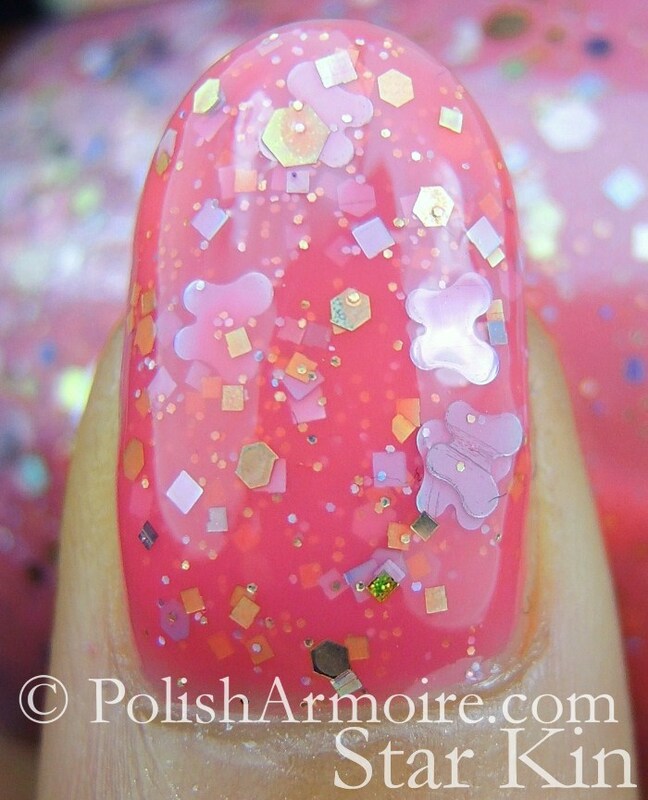 Here are some macro shots of the two polishes! 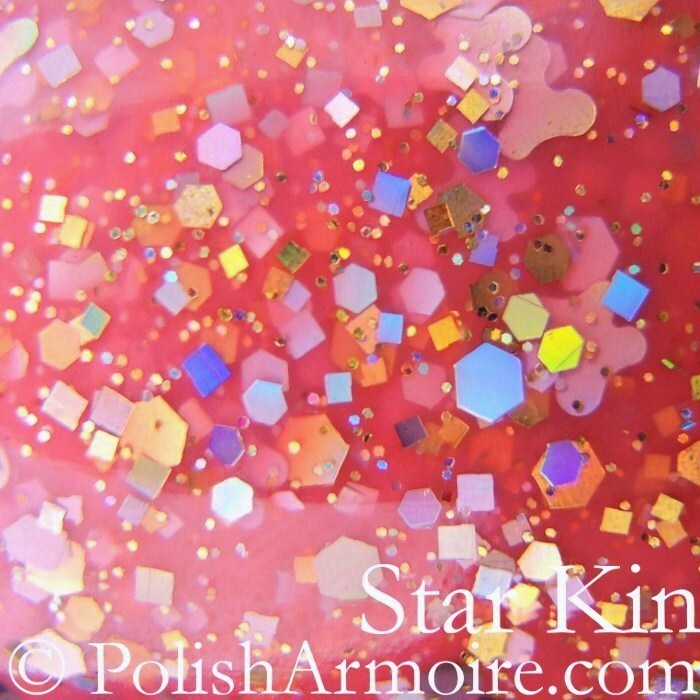 On my thumb I applied three coats of Disco Butterfly, a pink jelly polish with various sized gold and holographic silver glitters. 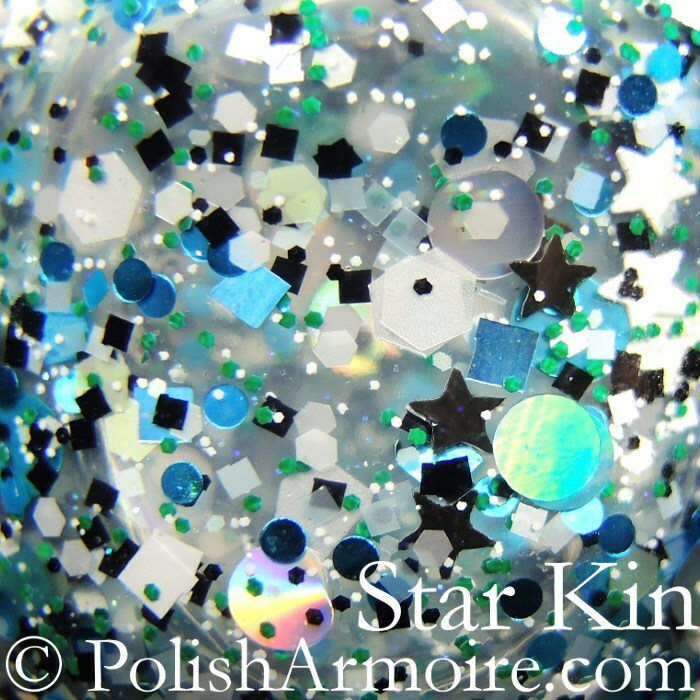 The macro shot really shows off how the holographic silver glitter changes colour! On the index and middle finger of my other hand I decided to apply two coats of Violet Disregard, a purple jelly filled with various sized purple and blue glitters. On my ring finger I have three coats of Magic, a gorgeous lilac jelly glitter polish with various shaped white and silver glitter. Magic pulls either lilac or grey depending on the lighting and I love the addition of the white star glitter. On my pinky I have one coat of Magic over two coats of Essie Smooth Sailing, a blue creme with silver micro-flakie shimmer. 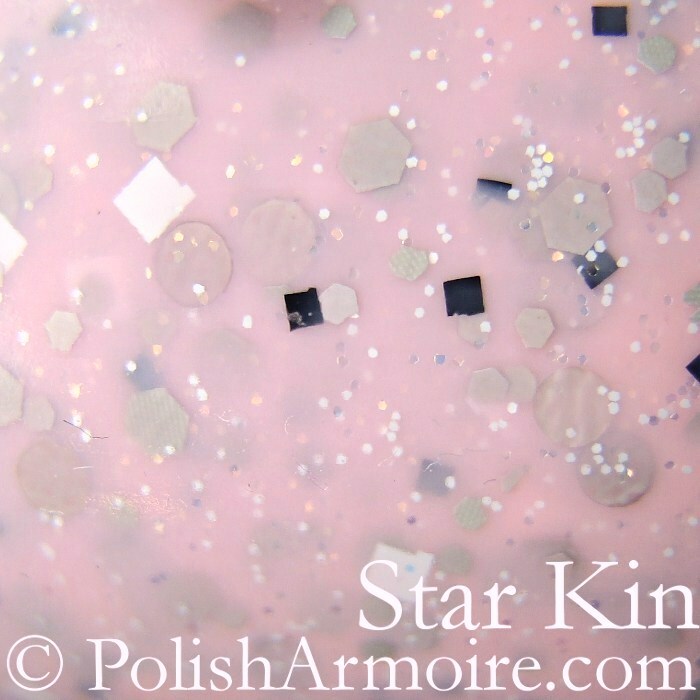 I then decided to layer one dabbed coat of Stellar (a chunky glitter topper full of various sized white, green and blue glitters) onto my middle and ring fingers. 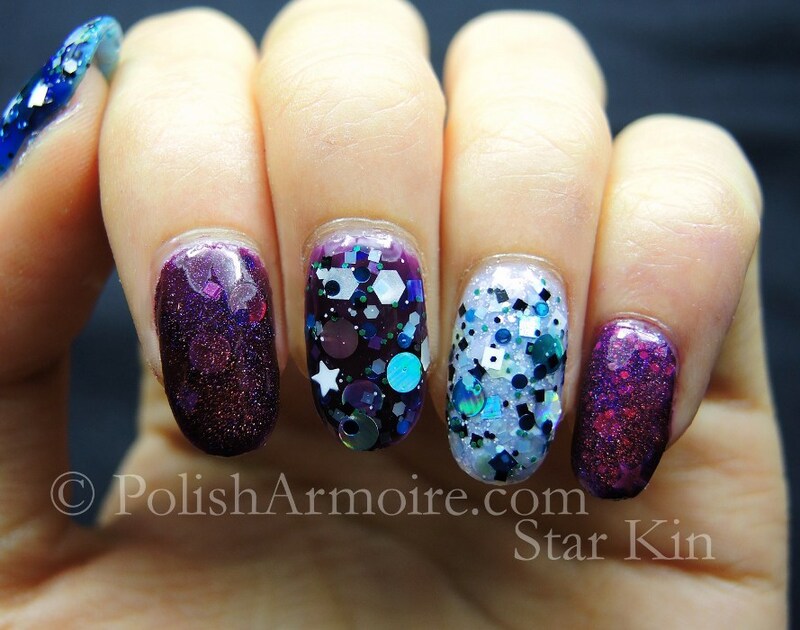 Stellar is a custom polish created for Serra, the blogger behind Addicted to Pretty Things. I also layered one coat of Shiraz (a dark red-pink linear holographic jelly polish) on my index and pinky fingers. 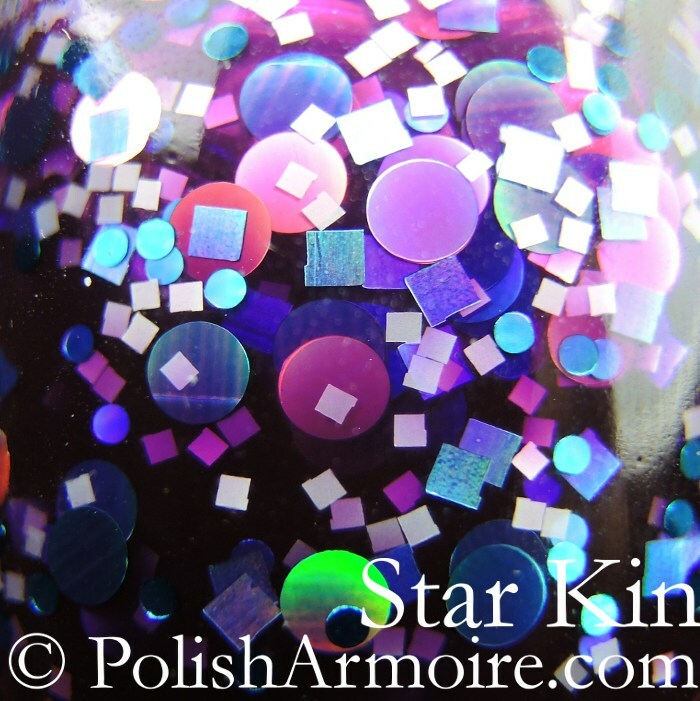 I wasn’t able to capture the holo effect very well but you can see it in the macro shot that follows. I love how complex the glitter mix is in Stellar. 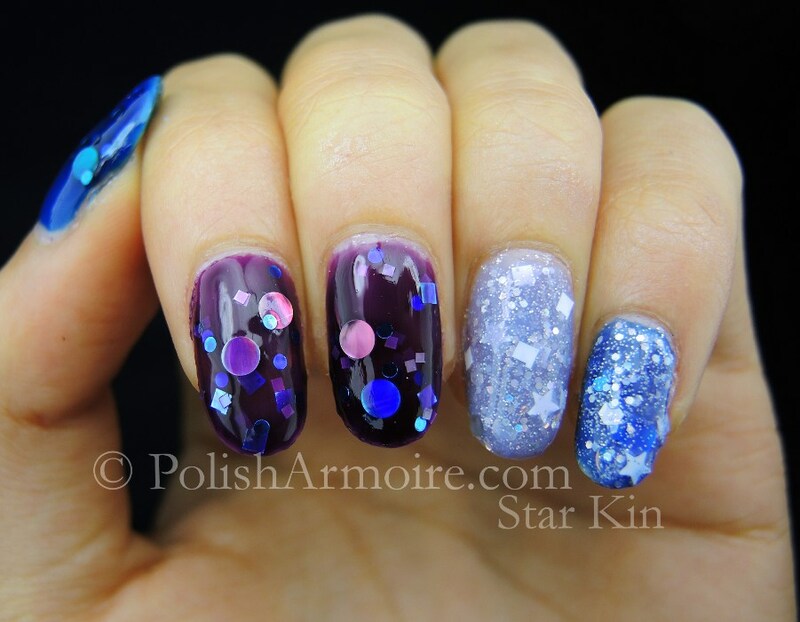 On my thumb I applied one coat of Whale Farts, a dark blue jelly polish with various sized blue circle glitters. If you’re looking for opacity I’d recommend either two coats or using a base colour underneath. I’ve used Poshe as my topcoat on all my swatches for a shiny finish and glitter smoothing where required. 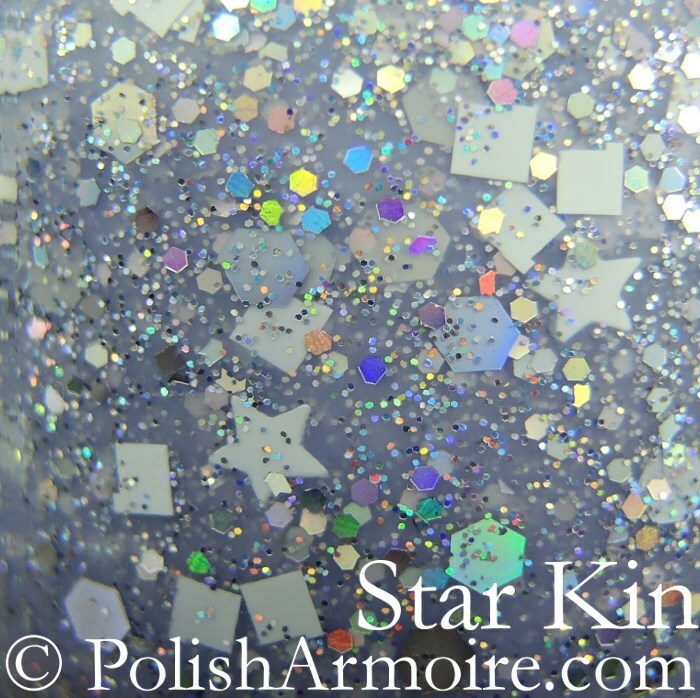 I’ll end this post with one of the small details that I love about Star Kin bottles which are the stars on top of the lids! Tags: Star Kin. Bookmark the permalink. WOW. I’ve got nothing else to say. What stunning photos, Grace! Wow!! Thank you! Fantastic post! I love those macro shots. Thanks Harriet 🙂 It sure was making me want to buy them again while I was picking which macro shots to use!